Home » aunt glendora , birthday » Happy 80th Birthday to Aunt Glendora! Happy 80th Birthday to Aunt Glendora! Lots of people can't believe she's really 80 now ("but you don't look it!" they all say). You wouldn't know it either if you knew how fast she gets around. Definitely an inspiration to live and let nothing stop you. 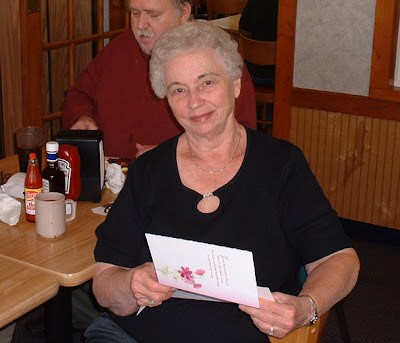 This picture was from the lil' breakfast we had in her honor at Golden Corral this morning. So here's wishing Aunt Glendora a Happy 80th Birthday!